I’m sort of obsessed with crumb cakes. The cake, the crumbs, I love it all. I’ve posted a number of crumb cake recipes on my blog and I’d probably have done more if I didn’t think that you might say “okay, enough crumb cakes already, T.” So I try my best to space them out. 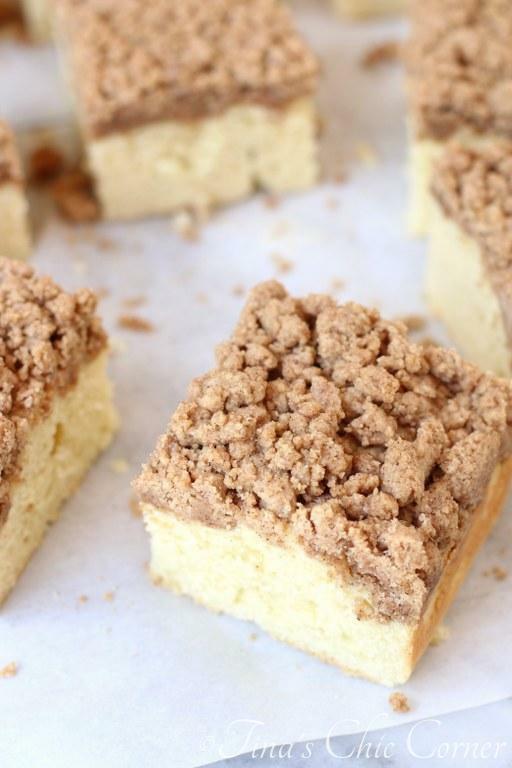 I know that I told you that the NY style crumb cake is the best one ever. I still stand by that statement. However, when I saw the recipe for this crumb cake, I simply had to try it to see how it compared. 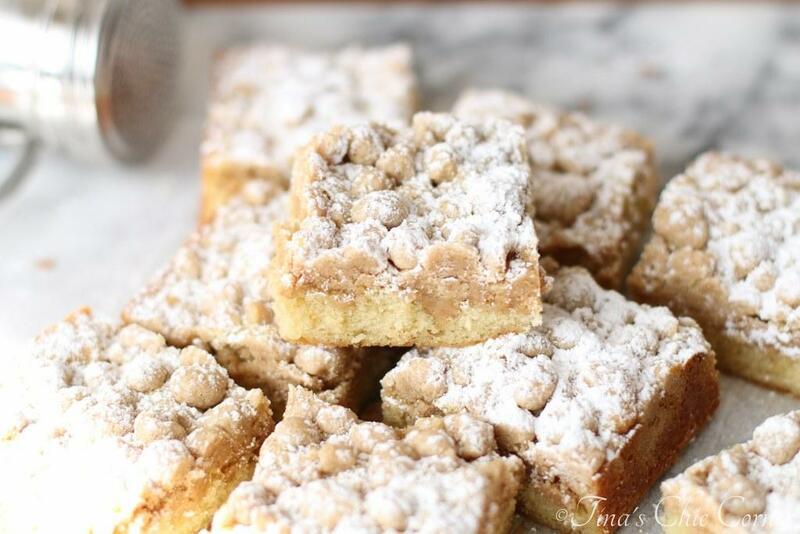 This crumb cake recipe is similar to the NY style one in that they are both awesomely delicious. Both have a layer of vanilla cake and both are topped with a mouth watering crumb topping. However, they are a bit different. This cake is taller and a bit more dense. This crumb topping tastes about the same but it takes about one minute to make. One minute, folks! I’m amazed that I don’t have roll the crumbs in this crumb topping individually to get that awesome crumby texture. It’s like crumb magic since the NY recipe takes like 14 hours. Well, maybe 30 minutes, but definitely not only a minute. I didn’t coat this crumb cake with powdered sugar, but by all means, feel free to do that. I love, love, love the stuff and normally I would have sprinkled about a half inch of the precious stuff on top. (Although “sprinkled” is probably not the correct word. My husband offers “shoveled.”) You could also drizzle some icing on top too. Neither is necessary, but both would add tons of useless sugar calories and therefore be better. In a medium bowl, mix together the flour, light brown sugar, cinnamon, salt, vanilla extract, and melted butter until it’s crumbly. Set it aside. Preheat the oven to 325 degrees F. Grease an 8 x 8 inch baking pan and set it aside. In a large bowl, cream the butter and white sugar until it’s light and fluffy. Mix in the egg and egg yolk. Set aside the wet ingredients. In a medium bowl, whisk together the flour, salt, baking powder, and baking soda. These are the dry ingredients. Add half of the dry ingredients into the bowl of wet ingredients and mix until just combined. Stir in the remaining half of the dry ingredients until just combined. Don’t overmix (Sorry… I’m sure that gets old hearing it but it’s a good tip if you don’t already know it.) The cake batter will be very thick. Scoop the cake batter into the prepared baking pan and spread the batter evenly. I dropped 4 to 6 dollops of batter, equally spread apart, to help spread the batter easily. 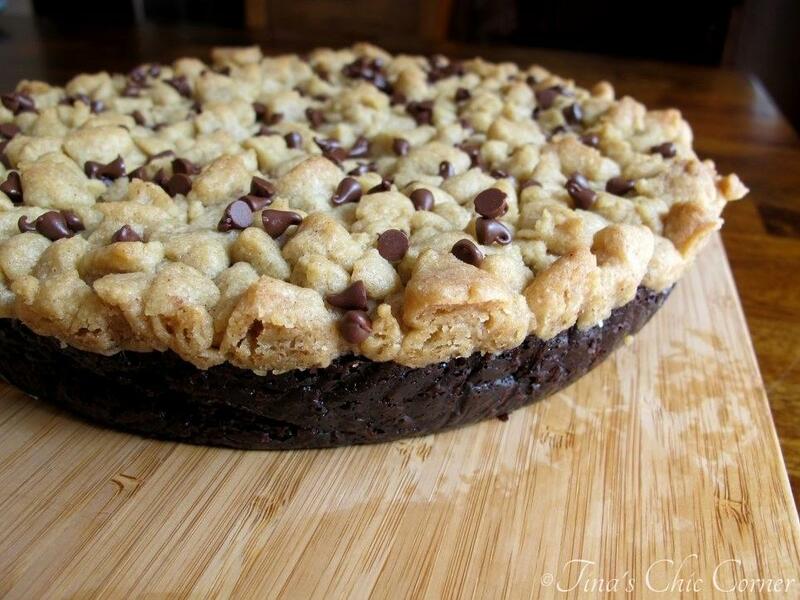 Sprinkle the crumb topping over the cake batter. Go for small and big crumbs for variety. Then very gently press the crumb topping into the batter. Bake the cake in the preheated oven for 45 to 50 minutes or until a tester inserted comes out clean. Here are some other amazing crumb cakes. 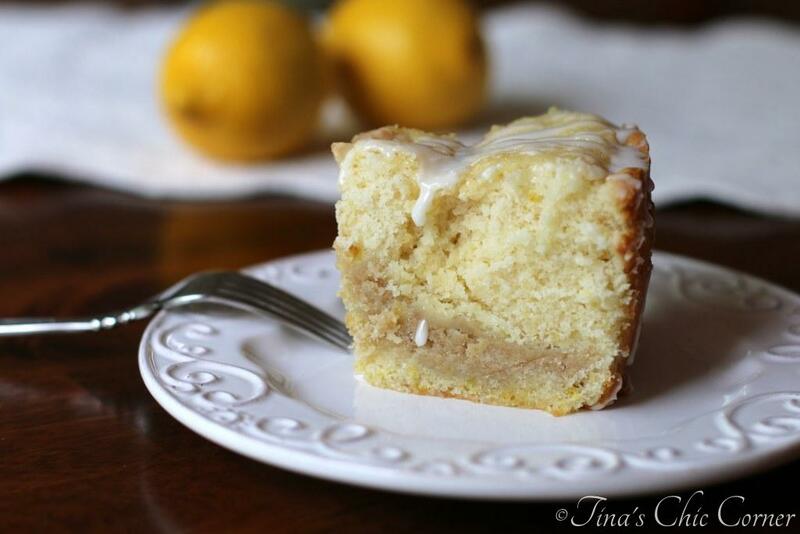 I love, love, love coffee cakes. ? Keep those recipes coming, Tina! Mmm sounds delicious, I love coffee! Thanks for sharing.